Jack Sawyer does a little bit of everything. The sophomore defensive end has 43 tackles, 12 1/2 for a loss, and 5 1/2 sacks this season at Pickerington North. He's also showed his value on the offensive side of the ball — he's responsible for 172 total yards with limited touches; six rushing, 77 passing and 89 receiving. All are reasons why he's at the top of Ohio State's list when it comes to the Buckeyes' 2021 recruiting class. 247Sports has Sawyer ranked as a four-star recruit and as Ohio's top prospect in his class. He's also ranked as the nation's third best overall prospect. So you can imagine his phone usually doesn't stop buzzing. "You can say my phone is always ringing. But I don’t really get annoyed. It just comes with everything and is a part of the recruiting process," Sawyer told Eleven Warriors. The hype surrounding Sawyer is certainly present. But he's figured out how to handle it. "I juggle it by just being me," he said. "I never brag or act different now just because I’m one of the biggest recruits in my class. I’m still focused on being a leader for my team." There's certainly plenty of time for Sawyer to weigh his options. He currently has offers from 11 schools including Ohio State, Michigan, Michigan State, Penn State and Cincinnati. "What it’s really going to come down to, for me, is my relationships with the coaching staffs and where I can see myself having the best career with football and academics," he said. 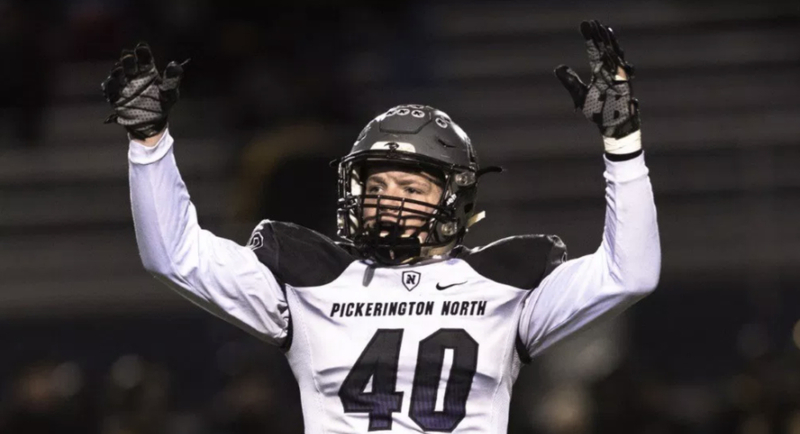 But first, there's work to be done at Pickerington North. The Panthers are 5-3 with losses to Dublin Coffman (31-28), Reynoldsburg (33-31) and Pickerington Central (16-7). That's left them on the outside looking into a playoff picture, ranked No. 9 in Ohio's Division I, Region 3 — the top eight teams in each region qualify for the postseason. But there's still two games left, coming against Lancaster and Gahanna Lincoln. "We could very well be 8-0 at this point and I truly believe that," Sawyer said. "We haven’t played our best football yet and we all know that. I think we’re going to make the playoffs and shock a lot of people by how far we end up going." Early last week, Ohio State sent an offer to Miami (FL) running back commit Marcus Crowley. He responded by quickly setting up an official visit to Columbus. Crowley, out of Trinity Christian Academy (Jacksonville, Fla.) will be in the Shoe on Nov. 3 when the Buckeyes host Nebraska. The three-star running back committed to the Hurricanes on Dec. 6, 2017 and has been considered to be a lock there ever since. Competing against top competition this fall, Crowley has rushed for 1,164 yards and four touchdowns, averaging over 10 yards per carry. That type of production is needed in Columbus after Sampson James' decommitment less than two weeks ago. Will it be tough to make happen? Sure. Is it impossible? Absolutely not. After offering Crowley last week, Ohio State offered yet another Miami commit Tuesday afternoon, going after three-star safety Jaiden Francois. Francois, out of South Dade High School (Homestead, Fla.) committed to the Hurricanes on July 27. He's ranked as the No. 71 recruit in the state of Florida and No. 26 at his position. He also has offers from Florida State, Georiga, Syracuse and Central Florida.